We manufacture micronised super fine China Clay also known as Kaolin mineral powders under our brand "KOLINE"
Kaolin mineral is available in India at several different mines. We select the best quality with minimum heavy impurities. The raw mineral is washed, made slurry, lavigated and then dried. The dry lumps are micronised in our high tech micronisers to very fine particle size. 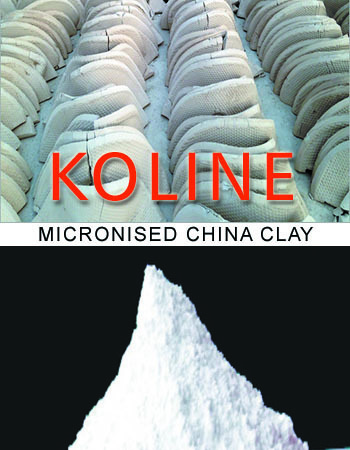 Our KOLINE powders offer superior pure china clay. Suitable for most of industrial uses. It is widely used in inert filler in various industries. We offer different grades as per the end use. WE OFFER KOLINE IN DRY POWDER FORM AND ALSO LIQUIID WATER SUSPENSION. Please contact us with your application details.